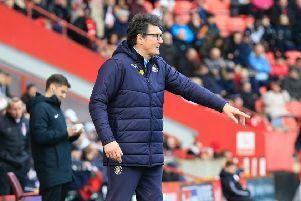 Luton Town made sure they finally stopped the rot defensively with a confidence-boosting first clean sheet in seven games at promotion hopefuls Portsmouth this afternoon. From the off, it was evident for all to see that was what Hatters had set out to do, with caretaker boss Andy Awford setting up his side to achieve the shut out, only their sixth of the campaign, by any means necessary. Striker Paul Benson had mentioned recently an ugly 0-0 was just what the side needed, and with Awford bellowing out instructions to his players to slow down the tempo at every opportunity, in particular keeper Mark Tyler, it was clear they were trying to do just that. Unlike Saturday’s 2-0 defeat at Wycombe, Luton did test home keeper Brian Murphy on one occasion, but it was all about the other end for Town, with captain Scott Cuthbert impressively marshalling the back four, who grew in confidence as the game wore on. Earlier, Awford had sprung a number of surprise changes for the fixture against the side he spent all his career at and managed last term, with Ryan Hall and Stephen O’Donnell in for their first league starts since August and September respectively. Jonathan Smith, Jack Marriott and Josh McQuoid all came in too as Cameron McGeehan, Sean Long and Craig Mackail-Smith dropped to the bench, with Danny Green and Olly Lee missing out completely. Hatters fashioned a great chance early on when O’Donnell’s cross was met by Hall who prodded wide of the target, although Pompey looked bright too, with Marc McNulty rifling over the top. However, under the vocal orders from an increasingly exasperated Awford, the visitors tried to stifle their opponents in the first half, never over-committing going forward, as McNulty eventually forced Tyler to palm his low shot away. Marriott was causing the odd moment of consternation in the home back-line as he broke away on the left and poked across goal, although Enda Stevens hacked clear. The Pompey defender was then in action at the other end, racing down the flank to send over a cross that was missed at full stretch by McNulty from a yard. Tyler was called upon to parry Bennett’s rasping drive, while the rebound was dinked over as he quickly stuck out a glove to knock the danger away once more. A dreary first half was enlivened by a moment of hilarity when Ben Davies’ free kick brushed the side-netting on its way behind with half of the home fans celebrating what they wrongly thought was the opener. Pompey’s PA announcer was clearly not paying attention either as he awarded the goal to Davies, leading to much mirth from the both sets of fans, plus home boss Paul Cook. Luton supporters were up themselves moments later when Hall’s free kick went well over, only for the visiting faithful to indulge in some pretend scenes of jublilation, earning an appreciative ovation from the home stands. Early in the second period, Hatters had what could be classed as their first shot on target in well over two hours of football as Marriott got a toe to Paul Benson’s flick-on ahead of keeper Murphy, who bravely collected the loose ball before Hall could pounce. Portsmouth captain Michael Doyle then spurned a glorious chance, heading over the top from close range after escaping Luton’s defence from a corner, with another set-piece seeing Matt Clarke head at Tyler. Hatters brought Mackail-Smith on for Marriott who had worked manfully but got precious little out of Adam Barton all afternoon and the sub had Luton’s first serious attempt, curling straight at Murphy. Luton were thankful to Tyler though with 17 minutes to go as Evans escaped at the back post with the keeper out to block and then react quickly to repel McNulty’s blast too. From Pompey’s 13th corner, in a game where Luton didn’t win a single one of their own, Doyle sent a flick header wide, while Luton fluffed a decent opening with time running out. Mackail-Smith won a free kick from the home defence, but symptomatic of their almost non-existent attacking play, Hall fired meekly into the first defender and O’Donnell’s follow-up came to nothing too. Luton almost suffered another stoppage time disaster as Davies’ volleyed cross was met by Clarke, but this time there was to be no heartache as he glanced wide. Attention now once again turns to matters behind the scenes as Hatters’ supporters will be waiting to see if a new manager is in place before their side’s next game, a trip to Bristol Rovers on Saturday. Pompey: Brian Murphy, Ben Davies, Enda Stevens, Michael Doyle (C), Marc McNulty (Adam McGurk 76), Caolan Lavery (Gary Roberts 63), Adam Barton, Matt Clarke, Kyle Bennett (Conor Chaplin 84), Gareth Evans, Danny Hollands. Subs not used: Alex Bass, Jayden Stockley, Ben Tollitt, Ben Close. Hatters: Mark Tyler, Stephen O’Donnell, Jake Howells, Magnus Okuonghae, Scott Cuthbert, Josh McQuoid (Cameron McGeeehan 62), Alex Lawless (Sean Long 77), Jonathan Smith, Ryan Hall, Paul Benson, Jack Marriott (Craig Mackail-Smith 68). Subs not used: Elliot Justham, Paddy McCourt, Luke Guttridge, Luke Wilkinson. Booked: Lawless 38, Doyle 67, Okuonghae 70, Long 80.